Last year, 378 listeners emailed me complaints and frustrations about things Williams said on Fox. The listener themes are similar: Williams "dishonors NPR." He's an "embarrassment to NPR." "NPR should severe their relationship with him." It’s gotten so serious that NPR's Vice President of News, Ellen Weiss, "has asked Williams to ask that Fox remove his NPR identification whenever he is on O'Reilly." The current NPR ombud said of Williams: "Some think he is a conservative because he's on Fox. Others think Fox uses him as a liberal voice because, whether true or not, a perception exists that NPR is liberal." I question whether listeners, overall, object to what Williams says outside of NPR or the fact that he says it on Fox. NPR legal affairs correspondent Nina Totenberg appears on the Washington, D.C., ABC affiliate, WJLA-TV. Rarely do I get email criticizing her TV appearances. But in 2008, there were a healthy number of emails attacking political correspondent Mara Liasson for her regular appearances on Fox News. "Michelle Obama, you know, she's got this Stokely Carmichael in a designer dress thing going. If she starts talking, as Mary Katharine [Ham, a conservative blogger] is suggesting, her instinct is to start with this blame America, you know, I'm the victim. If that stuff starts coming out, people will go bananas and she'll go from being the new Jackie O to being something of an albatross." 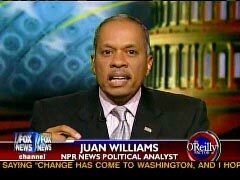 "I am concerned about the objectivity Juan Williams brings to his news analysis," wrote Alison Fowler. "He has made statements on Fox News regarding Michelle Obama that appear to paint her as an angry Black Nationalist without any basis in fact. Despite the fact that these statements were not made on NPR, they undermine his credibility as an impartial news analyst on your network." But then he reviewed the tape and realized that "the tone and tenor of my comments may have spurred a strong reaction to what I considered to be pure political analysis of the First Lady's use of her White House pulpit," said Williams via email. "I regret that in the fast-paced, argumentative format my tone and tenor seems to have led people to see me as attacking instead of explaining my informed point of view." His "Stokely Carmichael" comment got the attention of NPR's top managers. They are in a bind because Williams is no longer a staff employee but an independent contractor. As a contract news analyst, NPR doesn't exercise control over what Williams says outside of NPR. "Juan Williams is a contributor to NPR programs as a news analyst," said Ron Elving, NPR's Washington editor. "What he says on NPR is the product of a journalistic process that includes editors. What he says when he is not on our air is not within our control. But we recognize that what he says elsewhere reflects on NPR, and we have discussed that fact with him specifically in regard to his remarks on Fox News regarding Michelle Obama." Williams told Shepherd he was referring to articles in The Politico and The Atlantic Monthly. But he certainly could have cited Michelle Obama’s Princeton research paper, which discussed Stokely Carmichael’s "Black Power" book and theories of separationism and how they "guided" her in designing her thesis, asking Princeton alumni whether they were more in line with a "separationist and/or pluralist" viewpoint or an "integrationist and/or assimilationist" ideology. She was disappointed to find more "integrationists." Her thesis began with the notion that she would always be disdained by whites at Princeton: "Regardless of the circumstances underwhich I interact with whites at Princeton, to them, I will always be a black first and a student second."